Spring Program for all ages and PreK 4 graduation. Awards program for all ages starts at 9:30am. Check with your teacher for your party time! 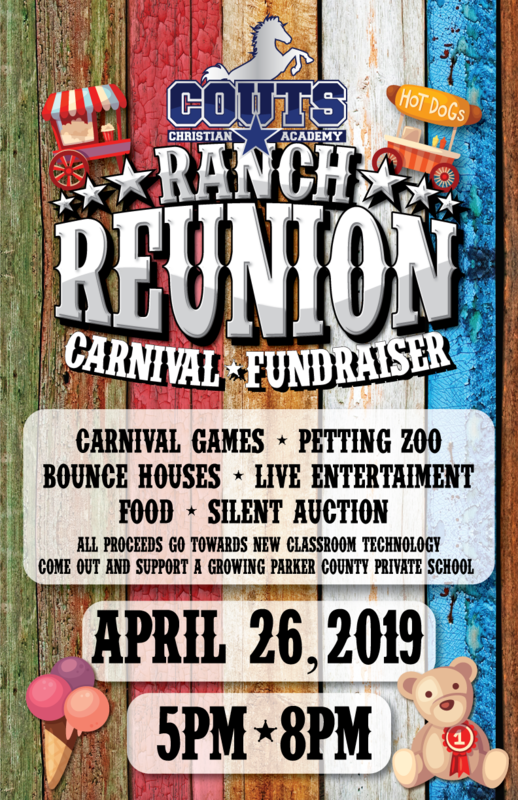 Ranch Reunion Tickets Go on Sale! Get your Ranch Reunion tickets and wristbands now! Pictures for all Prek- 6th Grade. Check with your teacher for day of picture. PreK 4 will take cap and gown pictures! Enrollment for the 2019-2020 school year is open for all families! Enrollment for the 2019-2020 school year will be open for current families only. If your interested in an affordable Christian education come check us out from 6-7:30pm! We will also be hosting a STEAM night for all students the same night. Calling all current PreK 4 students! Will your child be in Kindergarten next year? Come check out our wonderful Kindergarten Program! Parents will get to meet the teacher and learn all about the curriculum and learning environment while your children will get to make a craft and have a snack. Have a very Merry Christmas and a Happy New Year! Students return January 8th! Ask your teacher when your class party is! No school! Have a very blessed Thanksgiving! We will have a school wide family feast at 11:30am in the Gym. Please sign up to bring a dish and invite the family! Red Ribbon Week! We will have dress up days to show our support of traveling through life drug free! CCA’s 2nd Color Run Fundraiser! We will be raising money to update the playgrounds! Come meet your teacher and drop off your school supplies. Extracurricular sign ups will be in the welcome center. Pastries with Parents will be May 11th from 7am-8:45am. We will have a come and go breakfast for parents to enjoy with their child. Please make sure if your child is not enrolled in early care you must wait to drop off at 8:45am. All early care children may still be dropped off in the gym from 7am-8:45am. No School! Have a happy Easter!! Easter Parties will be March 28th or 29th depending on which day your child attends school. Your teacher will give you more information regarding times.